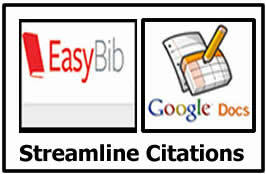 EasyBib is a free and popular tool for creating citations. By using this tool, students no longer need to learn to format citations, which means they can focus on the reason for creating the citations and the importance of giving credit to the author. EasyBib has some really great features worth exploring. Now there is a button to easily export citations to Google Docs. This one-click feature really streamlines the process by creating a Doc, naming it, and popping in directly into the user’s Google Docs account for use. 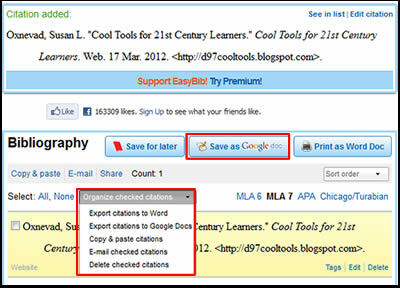 If you aren’t using Google Docs, you’ll notice some alternate, but handy ways to export citations, pictured below. The EasyBib App features a scanner option to help students easily create bibliographies from book sources. This includes the ability to search by title and ISBN which can be quite helpful when the bar code is not readable by the device. The video below provides a good overview of how the EasyBib app works. EasyBib supports it’s own social search engine designed to shows users a list of sources that have been used on a particular topic. In addition, it shows the credibility of the sources commonly used. Click on the tab at the top of the screen to access lessons plans to help teachers make the transition from traditional print research steps to electronic research. The lessons plans are simple and they cover a nice range of appropriate information literacy content. Great find Susan. There are so many people I can send this to – thanks very much.